In this product review we test out the EXTRATIME plaster retarder from Eazymix to really see how much of a difference a sachet of EXTRATIME makes to the time a plasterer has to work with his skim plaster wall. We also wanted to see if the addition of the retarder allowed for a better finish due to the extra time that we had to work with it and also what benefit this would give to a plasterer out on site. 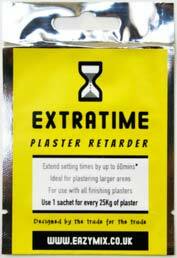 What is EXTRATIME Plaster Retarder? We organised a way to test the setting time of EXTRATIME against the setting time of an ordinary plaster mix by dividing a plasterboard stud wall in two halves using scrim tape as a boundary marker. One half of the wall was done in plaster containing the retardant while the other half was done, at the same time (albeit 3 minutes difference). It was clear, even after the first of two coats that EXTRATIME was going to hold back the setting of the plaster. When both walls has two coats on, the usual 10 – 15 minutes was allowed for the plaster to set hard enough for a trowel up and when we went back to work the ordinary wall was ready but the other wall needed another 40 minutes before it was ready to trowel up. This is absolutely fantastic for DIY Plasterers as it gives them a bonus 40 minutes to an hour, per bag. That is an extra hour to get 5 square meters finished and all you have to do is add 1 sachet of EXTRATIME to the water before you mix your skim plaster. The trade will find a massive use for this plaster retarder too. Huge warehouse walls would usually have to be done in two hits as its impossible to get huge amounts of plaster laid on and floated without quite a few guys. Now a single plasterer can cover a greater area giving him plenty of time to come back and float up. To sum up, this really is a great product and something the Home Improvement Industry has been crying out for, for years. See how we got our results by watching the video above and reading our on-site test details below. Using the DIY School as a testing ground we prepared an old, previously tiled surface for an over skim of plaster. All of the old tile adhesive was removed and the existing skim plaster had a coat of PVA applied to remove some of the wall absorption. 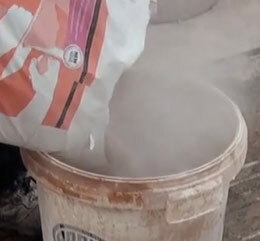 Two buckets of multi-finish skim plaster were then mixed at the same time. 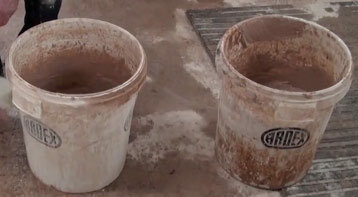 1 bucket contained plaster with EXTRATIME in the water, the other, a perfectly ordinary bucket of multi-finish skim plaster. The sachet was simply cut open and tipped into the water, which was then thoroughly whisked using a mixing paddle as you can see in the video. Once the buckets were mixed they were taken over to the prepared wall which had been divided in half by using a couple of lines of scrim tape vertically down the centre of the wall. The scrim tape, as plasterers know, can be used to provide a straight edge when large areas are plastered in sections. The sections can be divided up by using scrim tape which is then peeled off when the plaster begins to set. This is further explained in the video. Both halves of the wall were then plastered, one half with the ordinary skim, one half with EXTRATIME. Two coats of plaster were applied, giving a total thickness of 4 to 5mm of skim plaster. The walls were then allowed to set for the usual 10 minutes it takes for a skim plastered wall to start going hard. We used the fingerprint test to see if the walls were ready. The skim plastering fingerprint test involved pushing into the plaster with an even pressure to see if (without wiggling your fingers) you can push right through to the plasterboard beneath the plaster. If not, then you are ready to pass over the wall with a float to start to get rid of the float marks. The ordinary wall was ready for a pass with the float as we expected but the wall which had been plastered with EXTRATIME mixed with it, was nowhere near ready. It took another 35 minutes for that half of the wall to be ready for trowelling. Once set, the EXTRATIME wall was trowelled up to a lovely smooth finish just as the ordinary wall had been. Apart from the setting time, there was absolutely no difference in the feel of either plastered surface. The workability was not affected and the finish was the same. A little like the KFC Chicken recipe and the secret sauce used in Heinz Baked Beans, the chemical formula for the retarding agent used is a well kept, and closely guarded secret. All we are allowed to say is that it is a chemical additive which slows down the curing process by slowing the crystal formation that causes the gypsum plaster to harden. Make of that what you will, all we know is, it works! However, a tradesman, practicing his craft day in-day out, can plaster many tens of square meters of wall in a day. They know how much to lay on so that when they get to the end of one wall, the first wall they did will be ready for trowelling up. This allows the to move round a room freely, easily and quickly. The Home Improver however does not practice. Because it looks so easy, they start on a wall with little preparation expecting to float gracefully over the surface of the wall making it nice and smooth in no time. It’s not until they have spent 20 minutes trying to flatten out the first section that they realise the plaster is almost hard in the bucket with 3/4 of the wall left to do. Its benefits are many to both the Home Improver, DIYer and Tradesman and include such things as allowing larger areas to be plastered before the setting time is reached providing more time to get a much more professional finish. The real benefit to the tradesman that uses bag after bag of skim plaster, is that every sachet of gives exactly the same results, in the same conditions. The timing can be worked out perfectly and there is no panic, however much of the wall you have laid on. We knew from the moment we heard about it, just how useful this could be for both the Home Improver and the trade. Our job of course, is to keep an eye out for things that will make DIY and Home Improvement easier for you guys clicking into DIY Doctor regularly and this is certainly one of those things. In the same conditions, it will give you the same results time and time again. 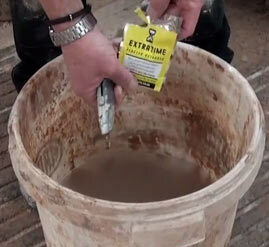 An extra 1 hour to work with a bag of skim makes skim plastering accessible to every DIYer on the planet. We can see this being a great seller and wish you the very best of luck with all your plastering jobs!